Your vehicle is much more than a transportation appliance. It gets you to work, takes care of errands, goes on dates, and vacations. You could say it’s part of the family; or even an important business partner. GRAND ISLAND auto owners depend on their vehicles for so much. The wise team of proactive automotive professionals at Whitaker Auto Repair in GRAND ISLAND understand how essential your car or truck is to your life. And we want you to know that you can trust in us to keep you safely on the road. We put a vital emphasis on preventive maintenance – taking care of the routine things that help your vehicle last longer, perform consistently, retain its safety, and prevent breakdowns and repairs. And when your vehicle is sidelined, we’ll do everything we can to get it back in the game as fast as possible. To us at Whitaker Auto Repair, keeping the trust of GRAND ISLAND drivers requires investing in our superb employees, their training, and technologically-advanced equipment. When we do that, we can keep our promise of high-quality, convenient service and repair that’s done right the first time. We appreciate the confidence you have in us and are convinced we can earn it over again each time you bring your auto in for service. We hope you opt for Whitaker Auto Repair first for all your car care needs. As we GRAND ISLAND car owners know, our vehicles have factory scheduled maintenance items items. These range from oil changes, to timing belt replacement, to brake inspection. These recommendations are usually made for certain mileage or time intervals. For some vehicles, certain recommendations are clustered around major intervals like 30,000/60,000/90,000 miles. Following automobile manufacturer recommended service goes a long way towards preventing breakdowns and keeps your vehicle operating as safely and economically as possible. What GRAND ISLAND auto owners may not know is that you can have ALL of your auto maker recommended service performed right here at Whitaker Auto Repair in GRAND ISLAND – even while your vehicle is still under warranty. That’s right; your factory warranty is protected wherever the factory recommended service is performed. And following the recommended inspection schedule helps us uncover any potential troubles and allows us to make needed improvements before they become big, expensive problems. So if your new sedan comes with a couple of free oil changes – who could blame you for taking advantage of that. With our reputation for high-quality work, convenience, and a fair price, you know you are in good hands for all of your car care needs during your factory warranty period and beyond. Your auto maker owner’s manual contains your maintenance schedule. And of course our Whitaker Auto Repair service advisors have access to the factory schedule and can help you stay up-to-date with scheduled items. Smart GRAND ISLAND car owners opt for Whitaker Auto Repair to perform an essential preventive maintenance evaluation to make sure their vehicle is in top shape. Thanks for visiting the Whitaker Auto Repair auto care blog. Today’s post lists 5 important reasons GRAND ISLAND motorists should follow recommended maintenance schedules. A well-maintained car doesn’t put you and your passengers at unnecessary risk. Think brakes, headlamps, tires. 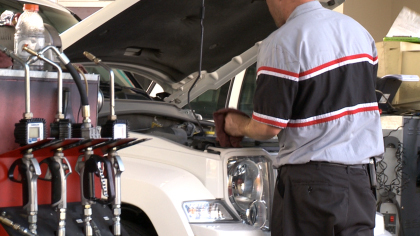 Regular maintenance is an investment in optimum gas mileage. Inadequate tire pressure, a dirty fuel system, and a clogged air filter are just a few things that reduce gas mileage. How many GRAND ISLAND used car buyers will pay full blue book for a car with a filthy engine, clogged filters and bald tires? Your warranty claims may be denied if your service history doesn’t fulfill the minimum requirements recommended by the automobile manufacturer. Regular maintenance prevents catastrophic, expensive repairs. First: Fluids. Oil, transmission fluid, coolant, power steering fluid, brake fluid, differential fluid, etc. We can take care of all of these for you at Whitaker Auto Repair in GRAND ISLAND. Then think Tires. Air, rotation, balancing, and alignment. And while you’re thinking tires, think brakes and shock absorbers. Air and Fuel. Air filter replacement, fuel filters and Whitaker Auto Repair fuel system cleaning. This doesn’t cover everything, but your Whitaker Auto Repair service professional will help you with the rest.